“Don’t be too ready to listen to stories told by attractive women. They may be acting under orders.” This was only one of the many warnings given to the 30,000 British troops preparing to land in the enemy territory of Nazi Germany nine-and-a-half months after D-Day. 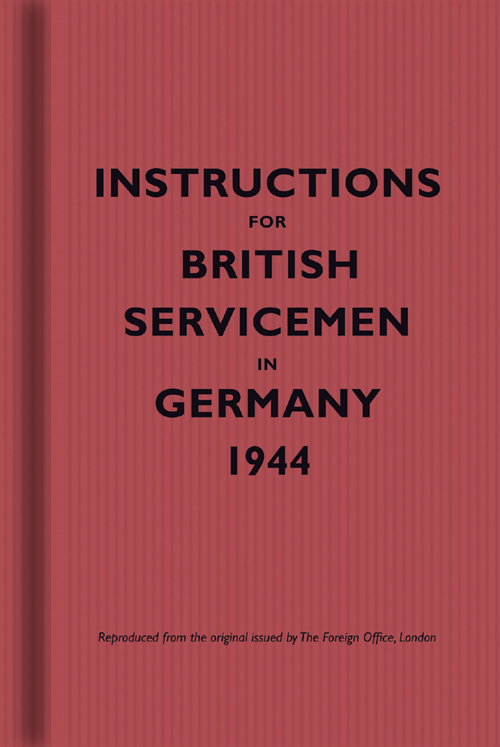 The newest addition to the Bodleian Library’s bestselling series of wartime pamphlets, Instructions for British Servicemen in Germany, 1944 opens an intriguing window into the politics and military stratagems that brought about the end of World War II. The pamphlet is both a succinct survey of German politics, culture, and history and a work of British propaganda. Not only does the pamphlet cover general cultural topics such as food and drink, currency, and social customs, but it also explains the effect of years of the war on Germans and their attitudes toward the British. The book admonishes, “The Germans are not good at controlling their feelings. They have a streak of hysteria. You will find that Germans may often fly into a passion if some little thing goes wrong.” The mix of humor and crude stereotypes—“If you have to give orders to German civilians, give them in a firm, military manner. The German civilian is used to it and expects it”—in the text make this pamphlet a stark reminder of the wartime fears and hopes of the British. By turns a manual on psychological warfare, a travel guide, and a historical survey, Instructions for British Servicemen in Germany, 1944 offers incomparable insights into how the British, and by extension the Allied forces, viewed their fiercest enemy on the eve of its defeat.